Karen Christopher is an inspired intellectual artist – a collaborative performance deviser, performer, and teacher. She spent 20 years with the acclaimed Chicago-based performance group Goat Island and is an honoured academic in London: Honorary Fellow of University College Falmouth, and Honorary Research Fellow in the School of Arts, Birkbeck, University of London, and Visiting Artist in the Department of Drama, Theatre and Peformance at University of Roehampton. 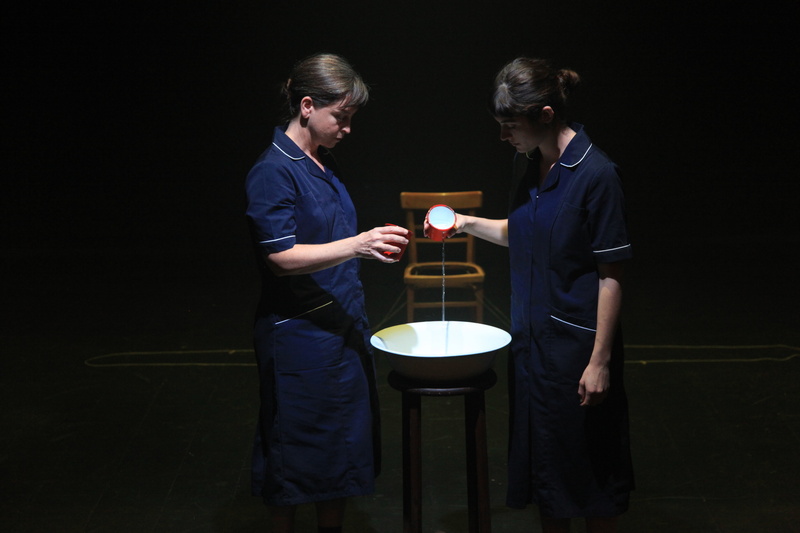 Karen’s latest piece, Control Signal, created in collaboration with Sophie Grodin, a duet that explores invisible influences, unacknowledged connections and follows the lines of electricity as it travels through the body. It’s an interesting performance piece of stories, surreal lectures and extraordinary demonstrations of the transference of thought and the synchronising of heart beats. You can read our review of Control Signal here. 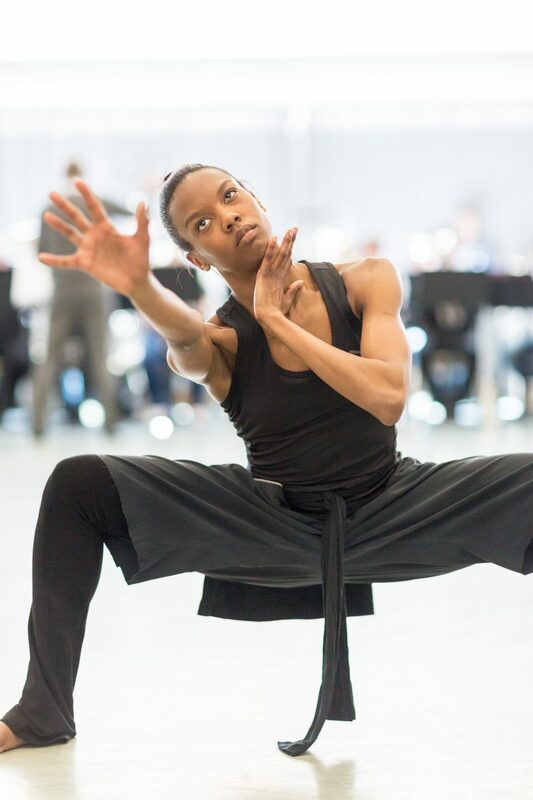 The Wonderful World of Dance asked Karen about her interest in duets, ahead of her performance of Control Signal at the Lilian Baylis Studio at Sadler’s Wells. Haranczak/Navarre Performance Projects is currently creating a series of duet performances. Why are duets of interest and an important focus for you? In a duet the engagement with each other is direct. There is no mitigating voice, no tie-breaking opinion. A pair differs from other quantitative social groupings in that each member interacts with only one other. For the on-going series of duets produced by Haranczak/Navarre Performance Projects the process, structure, and focus is determined by each two performer/makers who work collaboratively to invent strategies and generate material to make the work. The starting place of this work is the negotiation of the working practice and the ideas with which to begin work. This is an attempt to put in practice methods that I used, as well as taught, for 20 years with Chicago-based performance group Goat Island. Now in a series of tests of the collaborative process, involving the least hierarchical and most intimate working arrangement I can imagine, I document the changing dynamics of collaboration as it is put into practice in an assortment of duets between myself and other performing artists. What inspired your exploring of this subject? I’m interested in the dynamics between people. Formerly I had mostly worked in larger groups and noticed the substructures present within group dynamics. After parting from a group of 6 with whom I’d been associated for 20 years I realised that the most terrifying thing to me was to be in a studio with just one other person and having no interference or buffer from another. The german sociologist and philosopher Georg Simmel wrote ‘The decisive characteristic of the dyad is that each of the two must actually accomplish something, and that in the case of failure only the other remains—not a supra-individual force, as prevails in a group of even three.’ This nicely sums up my interest in working in duet form. Of course one could say more. You describe your work and approach as ‘listening for the unnoticed, the almost invisible, and the very quiet’; how do you translate this essence into movement? A pared down and permeable movement language leaves space for minute observation and the kind of attention that includes a wandering of the mind on the part of the audience. Far from distracting from the performance, a series of thoughtful digressions colours the experience for the audience and makes it deeply personal. You have extensive experience in both performance across the world with Goat Island, as well as working within an the academic setting, how have these elements influenced your work? The experience of working with Goat Island was incredibly influential in ways that I am constantly aware of but also in ways that I haven’t realised but which are revealed over time. It was a very immersive experience in which my whole life, both waking and dreaming, was filtered by the concerns of Goat Island. The Goat Island ethos determined the way I stepped out of the door in the morning to face the world. Goat Island influenced my sense of time and consideration. We always worked toward an openness to discovery and slowing down in order to see what is really there rather than what we expected to be there. This has been very important in my on-going work. My choreographic language tends toward the pedestrian with a leaning toward antic heightened theatricality and play. Who are your inspirations for your work? I’m inspired by questions from science and philosophy and sociology. I’m inspired by the day and the people in it and the impossibility of making one sense out of it. I’m constantly inspired by the people who participate in the courses and workshops I’ve taught. I’m inspired by the people I worked with in the past and those I am working with in the moment. I am inspired by connections made between two people, the sparks, the electricity we make together. It is difficult to speak of other artists as everyone I’ve seen is influential in that they inform what I do as well as do not work toward. I’m especially interested in looking at people in fields other than my own because with regard to them I make my own translation to my own medium rather than excepting theirs. For this reason I particularly look to music, literature, and installation other art forms. 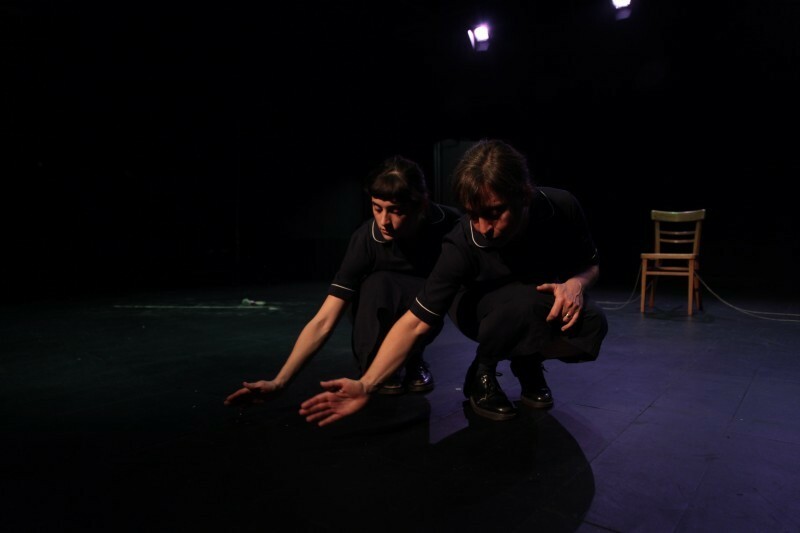 Control Signal has been developed with Sophie Godin who looks “at the way the performer, the space and the participant weave in and out of a dialogue and a negotiation with each other.” How have you both bought these different viewpoints together to create one coherent piece? Sophie and I have woven our two viewpoints or sets of concerns together much the same way two colours are woven together. Sometimes they complement each other, sometimes they provide contrast, and sometimes they obliterate each other depending on how they are used. We are committed to allowing difference appear side by side. Sometimes that is more apparent than others. What advice would you give to aspiring performance artists and choreographers? My advice to aspiring performance artists and choreographers is to make work as often as possible in what ever ways are available. We make the work we can in the time we have and with the people and materials to hand. Slowly over time the work grows and changes and progresses according to our interests and as long as the work is being made manifest in the world and not simply stuck in out heads we are learning from it. In this way there is a chance for resources and opportunities to become available. Showing works and making connections with other artists and people working in the same field creates future opportunities. People with whom you’ve had a good experience working come back later in life either as inspiration or actual present opportunity. The work that you do over your life creates a bank of experience that you may draw from much later in life and even when you least expect it. Do the work that you want to do and make a place for it in the world. Read our review of Control Signal.